States and municipalities across the country are leading a localized push to raise the minimum wage. Twenty-two states have a higher minimum wage than the federal standard of $7.25 an hour, and some other states have been proactively increasing the minimum hourly wage in their jurisdictions. For example, on July 1, 2014, California’s minimum wage increased to $9 per hour, providing state workers with the first such increase since 2008. That amount will increase again to $10 per hour starting on January 1, 2016. Additionally, San Francisco and San Jose, CA will adjust their minimum wage annually, based on the cost of living. In June, Massachusetts Governor Deval Patrick signed into law a measure raising the minimum wage to the highest of any U.S. state, to $11 per hour, by 2017. The law will raise the state’s minimum wage in stages from its current level of $8 per hour and follows similar moves by neighboring Connecticut and Vermont. Earlier this year, Minnesota raised its minimum wage by more than $3, to $9.50 by 2016. California, Hawaii, Michigan, and Maryland also have passed laws increasing their respective wages to $10 or more in the coming years. According to the National Conference of State Legislation, 34 states in all are considering raising their minimum wage. A full list of state minimum wages in effect for 2014, as well as future increases, can be accessed here: http://www.ncsl.org/research/labor-and-employment/state-minimum-wage-chart.aspx. A number of municipalities are also raising minimum wages in their cities. 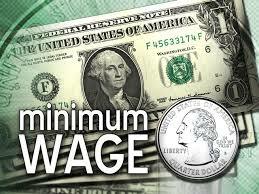 Most recently, Seattle, WA passed legislation increasing the minimum wage rate to $15 per hour. Seattle joins a growing list of cities—including San Francisco, Santa Fe, Albuquerque, San Jose, and Washington, D.C. (along with two adjacent Maryland counties)—that in the past few years have established local minimum wages above the federal level of $7.25. San Diego, New York City, Oakland, Los Angeles, and other cities are among the municipalities debating minimum wage increases.